The Cappadocian Fathers lived through the end of the Arian controversy and helped articulate the doctrine of the Trinity. The notable Cappadocians are Sts. 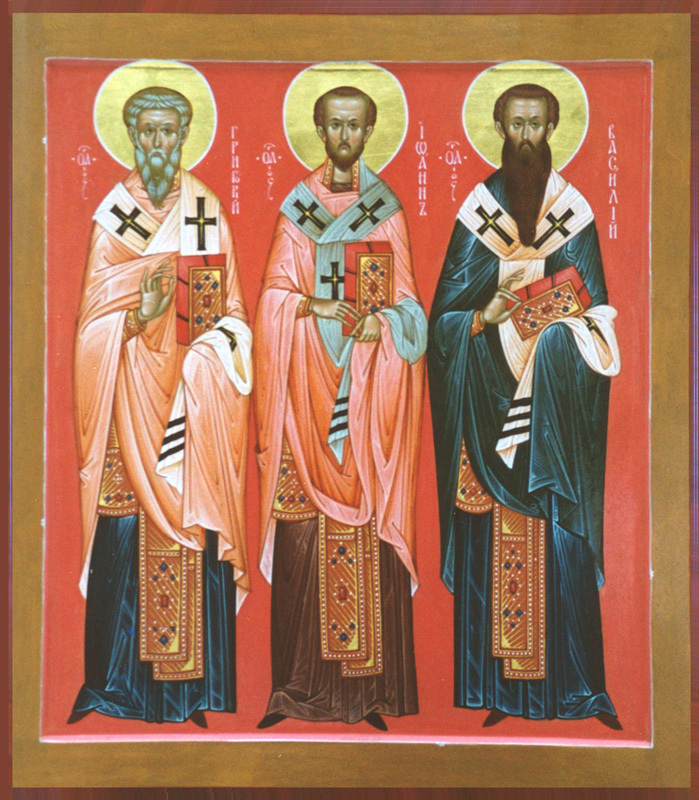 Basil the Great, Gregory of Nazianzus, and Gregory of Nyssa. Also to be noted is the sister of Basil and Nyssa, St. Macrina the Younger, who was an abbess whose convent provided a refuge for her brothers as they wrote about the ins and outs of Christian theology. St. Gregory of Nyssa (335-394), the youngest of the Cappadocians, was able to live in a time where he was able not only to defend orthodoxy against heresy, but simply to articulate it to the faithful. He wrote works not only of theology but also of mysticism, on the ascetical life, and exegesis. You can read about his life here when he was saint of the week, at abbamoses.com, where he is the saint for January 10 as well as the Catholic Encyclopedia. He was the Saint of Week on June 17, 2009, where I discuss his life and works. I also discussed his treatise On the Holy Spirit here. St. Gregory of Nazianzus (329-390) is the less popular of the three in western circles, although in Eastern Christianity (both Eastern & Oriental Orthodox), he is called “the Theologian”, a title shared only with St. John the Evangelist and an 11th-century Byzantine saint, St. Simeon the New Theologian. He produced a very clever synthesis of Nicene Trinitarian thought in his Five Theological Orations, and his mystical, theological, ascetic worldview shines forth in his poetry. I have blogged about him a couple of times: Ancient Theology Blows My Mind and Virginity vs. Marriage in the Fathers. St. Basil the Great. The Divine Liturgy of Our Father Among the Saints Basil the Great, According to the Use of the Antiochian Orthodox Christian Archidiocese of North America. Englewood, NJ: Antiochian Orthodox Christian Archidiocese of North America, 1990. This is a Eucharistic liturgy, but full of many beautiful prayers that could be used at any time; it is also an insight into the mind and prayer-life of the Easter Orthodox church. —. On the Holy Spirit. Trans. George Lewis. London: Religious Tract Society, 1888. This is a beautiful and brilliant defense of the godhead of the Holy Spirit, emphasising co-equal and co-eternal. Along the way, the character of the Holy Spirit is discussed as well. See my post about it here. St. Gregory of Nazianzus. On God and Christ: The Five Theological Orations and Two Letters to Cledonius. Trans. Frederick Williams & Lionel Wickham. Crestwood: Saint Vladimir’s Seminary Press, 2002. These orations, numbers 27-31, give St. Gregory’s vision of how we do theology, who Christ is, and how the Persons of the Trinity are related. —. On God and Man: The Theological Poetry of St Gregory of Nazianzus. Trans. Peter Gilbert. Crestwood: SVS Press, 2001. Here we find St. Gregory’s beautiful poetry that discusses the character of God and how we puny mortals are to related to him, including a couple of autobiographical poems. St. Gregory of Nyssa. The Life of Moses. New York, Toronto: Paulist Press, 1978. This is the translation that I have, although it is a different publication. It is a guide to the virtuous life, using a “spiritual” rather than literal approach to Scripture, basing the steps of the virtuous life upon that of Moses. Although it takes a bit of getting used to, many good ideas and truths are found in this book. Ludlow, Morwenna. Gregroy of Nyssa, Ancient and (Post)modern. Oxford: Oxford University Press, 2007. I’ve only read the beginning of the introduction, but this looks like an interesting read about this man whom Ludlow calls “elusive”. Meredith, Anthony. The Cappadocians. Crestwood, NY: Saint Vladimir’s Seminary Press, 1995. This book is what its title says. —. Gregory of Nyssa. London, New York: Routledge, 1999. A selection of some of Gregory’s key writings with notes, commentary, and introduction. Some of St. Gregory of Nyssa’s writings are available online at the Christian Classics Ethereal Library. One of the main concerns of ancient Christians is the path to perfection. We study theology in order to know God better and by knowing Him, purity of heart can be achieved. We seek purity of heart to be more fit for heaven and, again, to know God better. Bonhoeffer, Dietrich. The Cost of Discipleship. Foster, Richard J. Celebration of Discipline. A study of twelve main classic spiritual disciplines in order to deepen the Christian walk. Wesley, John. A Plain Account of Christian Perfection.